Juicy sliders on ramen mini “buns” infused with Sriracha Sauce and topped with cucumber, red onion and spicy Hellmann's mayonnaise. Cook noodles according to package directions. Rinse noodles and drain well. Transfer noodles to bowl; add eggs and 1 Tbsp Tabasco Sriracha Sauce. Mix well so that all noodles are coated with egg mixture. Evenly divide noodle mixture among the cups of a 12-cup muffin tin. Cover with plastic wrap; top with a second 12-cup tin, press down and remove. Freeze filled muffin tin for 20 minutes. Combine Hellmann's® Real Mayonnaise and Tabasco® brand Sriracha Sauce, mix well and chill. Combine the ground beef in a bowl with remaining 3 TbspTabasco® Sriracha Sauce and salt. Divide into 6 equal patties and flatten slightly. Cook burgers in a skillet or on grill to desired doneness. While burgers are cooking, remove muffin tin from freezer. Using a sharp knife, gently pry each ramen cake out of the muffin cups. 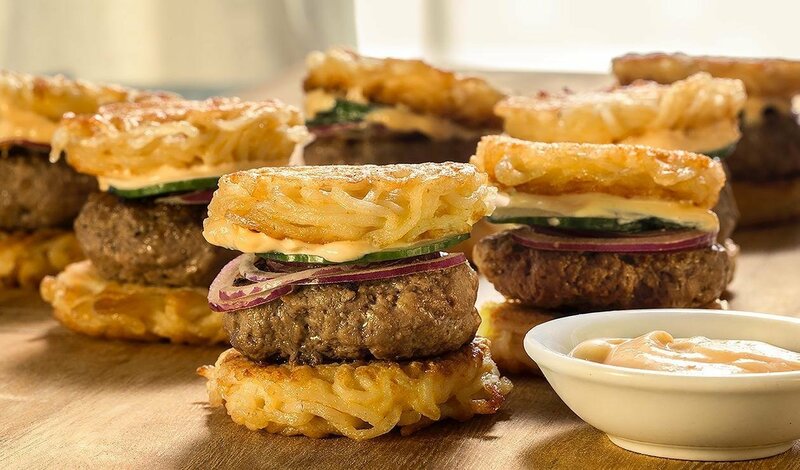 Build the burgers with the prepared 'ramen noodle bun', burger, cucumber, red onion and Sriracha Mayonnaise.